imageHOLDERS have further developed their capability to integrate OEM devices with their Shell+ tablet enclosure range being able to successfully integrate a barcode scanner, creating a multi-device kiosk suitable for a variety of different industries. We’re seeing an increase in inquiries for tablet enclosures which can securely hold different devices such as receipt printers, that can perform as a self service kiosk. An increase in requirements for a multi-device enclosure, has brought about the development of the Shell+ range. The tablet enclosure is incredibly versatile in its capabilities. 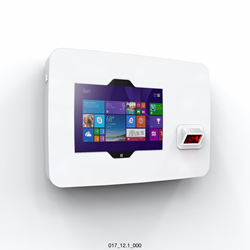 When fitting a tablet with a larger screen, such as the Microsoft Surface Pro 4, smaller devices such as a fingerprint scanner can be easily and securely integrated within the enclosure. If the requirements are for larger integrated devices such as a card swipe, the tablet enclosure can then fit tablets such as the Linx 1010 or Samsung Galaxy Tab S2 with a smaller screen, leaving more room for multiple devices. By integrating OEM devices such as chip and pin readers within a tablet enclosure, businesses can create a self service payment point which can be securely mounted on a wall, counter or floor standing kiosk. Designed for larger tablets with screens up to 12.9 inches, including the iPad Pro, Dell Venue 11 and Microsoft Surface Pro 4. The Shell + 12 can also be used with smaller tablets such as the Apple iPad, Samsung Galaxy Tab 10.1 and Linx 1010, allowing more space for larger integrated devices such as card swipes to be positioned alongside the tablet.